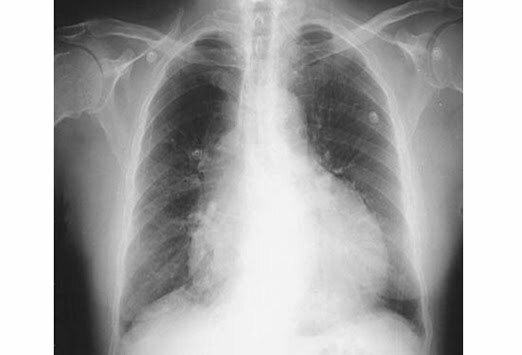 Fluid in the pericardial cavity is typically seen as a water bottle shaped heart. A pericardial paracentesis of only 15-30 mL can be very beneficial for the patient. This is done by using a syringe at a point 1-2 cm inferior to the left of the xiphochondral junction at a 45 degree angle to the skin and in the direction of the tip of scapula or shoulder. This procedure must be carefully carried out under continuous ECG monitoring.